Houses & Homes VA: The Most Awesome Home Improvement You Could Ever Have! The Most Awesome Home Improvement You Could Ever Have! OK, maybe I am a bit behind the times but when I saw this I just had to write about it! Here in Virginia we have some very cold winters and if there’s one thing I hate it’s a cold bathroom floor! I didn’t realize it was possible to actually heat the floor for so little money but now I know what my next home improvement project is going to be. Through my research I have discovered that there are a number of different radiant heating systems that you can have installed and some you can even do yourself. For the sake of simplicity I decided to concentrate on a pretty simple system designed for the bathroom but there are many different types available and you can have your entire house fitted with heated floors if you want. Talk about luxury! This particular system is designed to be installed on the floor under tile so if you are going to install tile in your bathroom now is the perfect time to do this. You can buy some pretty simple DIY systems at your local home improvement center and an average bathroom would cost less than $200! You can’t beat that. Here’s some tips on how to do it right. Even though connecting the mat to the electricity is easy to do I won’t be discussing that part here. It’s up to you if you want to do that part yourself or get a professional. Your first step is to “dry fit” the mat. That simply means laying the mat on the floor and cutting it (if needed) for a perfect fit. DO NOT cut the heating cable when fitting the mat, only the mat itself. You don’t need to cover every inch of the floor, just where you normally walk or stand should be fine. 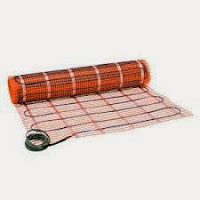 Also make sure that the different sections of the mat are no further apart than recommended by the manufacturer. Too much space will cause “cold spots” on the floor. Next you will install the sensor wire for the thermostat. All you need to do is embed it in the mortar. You will actually be placing the tiles over top of everything so it will be completely hidden from view. Now you simply staple the mat to the wooden subfloor. Be careful not to staple through any of the wires and you’re done! Just be sure to use enough mortar to cover the matt and wiring and install the tiles as usual. It really is a simple process to install this radiant heat system before the actual flooring in your bathroom and it is very inexpensive. Now you can keep your feet toasty warm no matter how cold it gets!